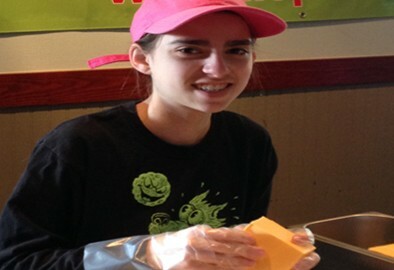 Brooke is a Mount tabor High School freshman who has become a regular volunteer on Saturdays. She first heard about H.O.P.E. through her school, where she is a member of the Key Club. Like many of our wonderful young volunteers, she first signed up at H.O.P.E. to get volunteer credit hours but now donates her time because she appreciates the opportunity to help others. And she has a lot of fun! Brooke is a great recruiter for H.O.P.E also. She frequently brings a friend with her, and she has even brought her brother with her as well. You will find Brooke on the lunch line making sandwiches and sharing her hints for how to help the lunch assembly line move quickly. Brooke Maynard … short in stature, tall in heart!